DOU Prevent Street Flooding – Be aware. Be informed. Be involved. What protects your street and property from street flooding during big rains? It’s your storm drainage system. Because of its age, it needs constant care by City of Sacramento Utilities staff. They make sure it’s always working during the rainy season so rain water flows out to the river rather than backing up on your street and into your car, home or business. This system of drains, pipelines, pumps and other infrastructure is what protects your property from serious damage. There are 38,734 street drains in the city—at least one on almost every block. 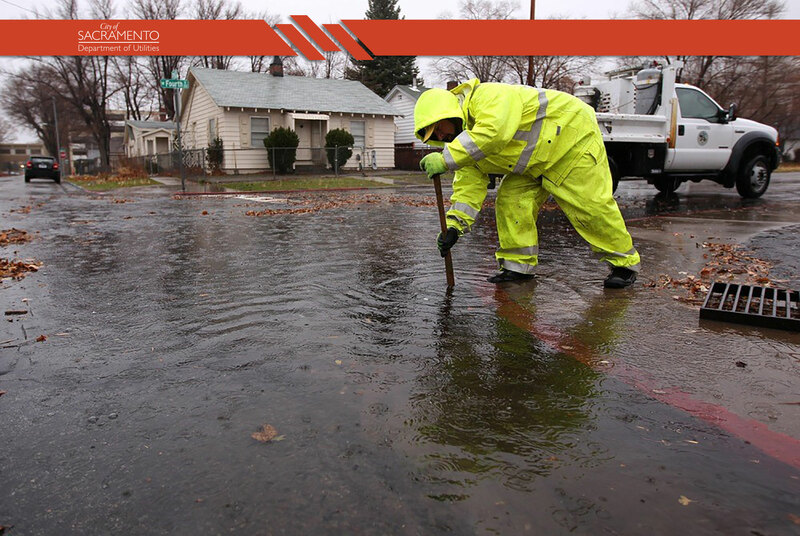 Street flooding is a sign that either a drain is clogged or another part of the system is blocked or has failed. That leads to property damage of cars, homes, businesses and many other safety concerns. Blockages can be caused by leaves, trash, cigarette butts or other debris. Not only do they create problems for you and your storm drainage utility, they can damage the environment if they make their way into our creeks and rivers. We have a square at the 2018 Chalk it Up event. Come find it and pick up information about Sacramento’s storm drainage system. Does your organization or neighborhood group want an in-person presentation about the storm drainage system? Have a question or comment about the storm drainage system or information campaign? © 2018 City of Sacramento Department of Utilities. All rights reserved.